Trimming the New Year Tree! - Super Inky! Hello everyone! One of my favorite family traditions is decorating a tree for the holiday season. In my family, we call it a New Year Tree because we celebrate New Year instead of Christmas. After debating whether to set up a pink tree with white lights or a white tree with colored lights, I decided on the white tree. My parents put the garland and lights on the tree for me, but I get to do the ornaments! 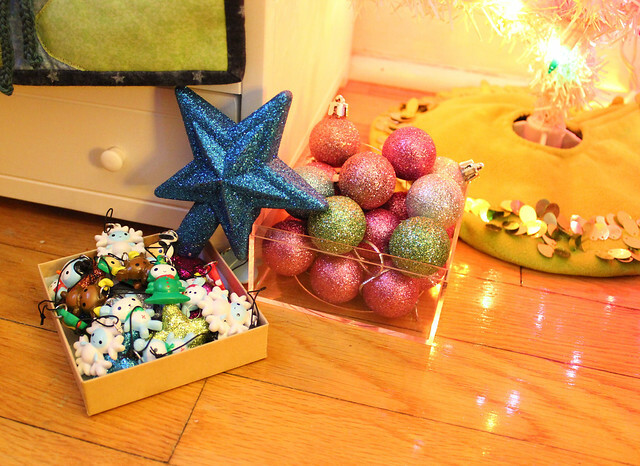 Here are my boxes of ornaments and my star for the top of the tree. I love the little character ornaments- I have had them for many years and they are my favorites! I love the sparkling ornaments too- I love sparkly and shiny decorations during the holidays! 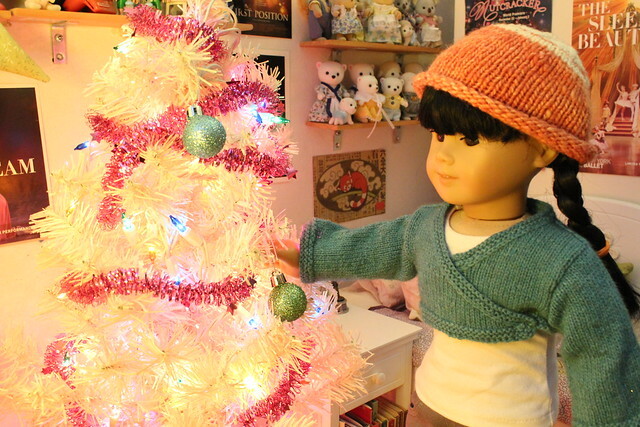 First I had to put strings on my ornaments so that I could hang them on the tree. I had beautiful silver string- isn't it pretty? It has little glittery bits in it and now I have sparkly shinies all over my outfit and in my hair! Once I had strings on all my ornaments, I started hanging them on the tree. Of course, I put on holiday music as I worked. 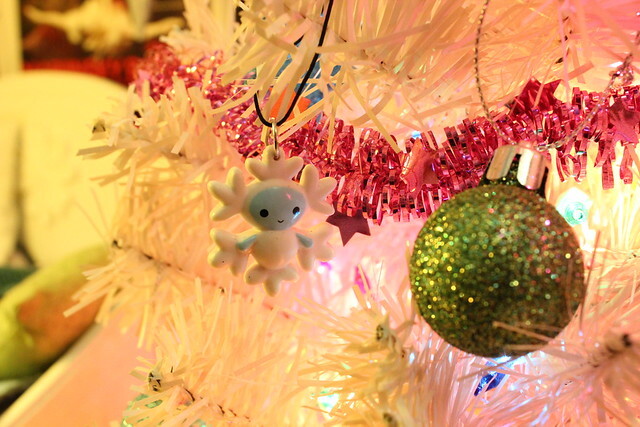 This little snowflake is my favorite ornament of all! I'm so glad I have three of him! Here I am hanging a little santa on the tree. In my family, we celebrate with Ded Moroz, or Father Frost, instead of Santa Claus. Ded Moroz is similar to Santa, but because I grew up celebrating with him, I like Ded Moroz better! Finally, it was time to put the star on top of the tree! I climbed up on my nightstand to do it. I probably should have asked a mom, but I was too excited! Luckily, I didn't fall. Phew! All done! 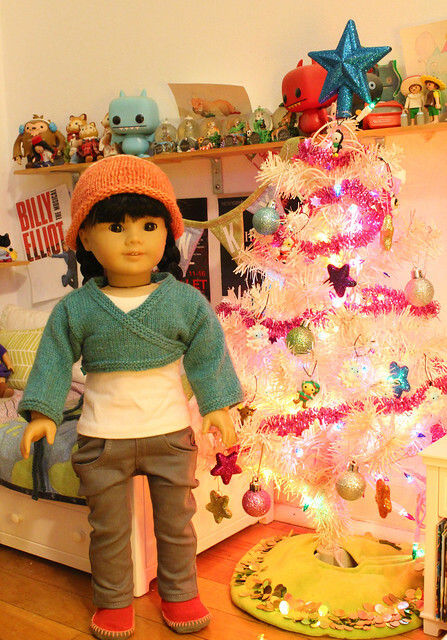 Here I am with my finished New Year tree, or ёлка, as it is called in Russian. I was adopted from Russia, so my family likes to include Russian traditions in our celebrations. Happy Holidays! 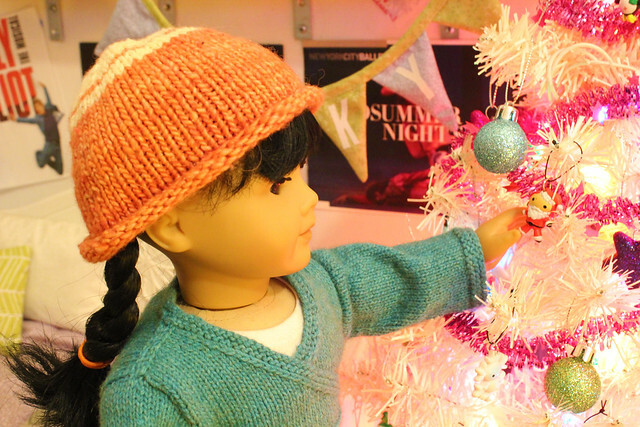 Do you decorate a tree to celebrate during the winter holidays? Are there any special holiday songs you like to sing? 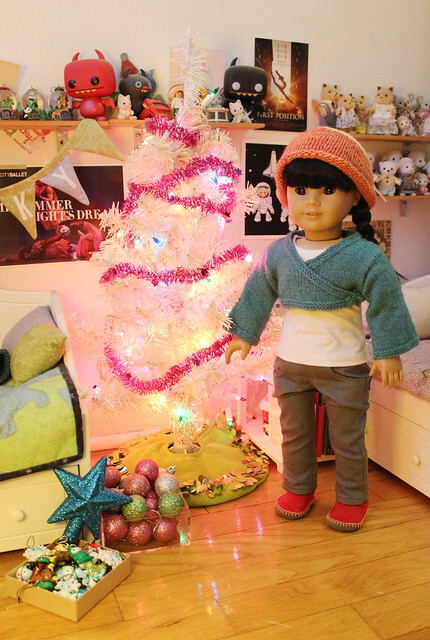 In this entry I'm wearing: white shirt and grey pants from Liberty Jane Clothing, slippers from American Girl, and handknit sweater and hat. I love your sweater; it looks very cozy! The color looks great on you, too. Your tree looks nice! I really love your collection of ornaments; I think the character ornaments are my favorites! They are just so bright and cheery. I do put up a tree for the holidays, but I haven't even started yet! I should get to it, especially since my parents and sister are coming over here this year. I really don't like to decorate for Christmas until school lets out, though. I'm pretty swamped with assignments still! I love your tree Inky! I like lots of different holidays songs. Plus, I love to decorate trees! I love your tree! My family is a mixture of Christian and Pagan so my sisters and I follow both; celebrating Yule on Christmas since they are basically done the same way. 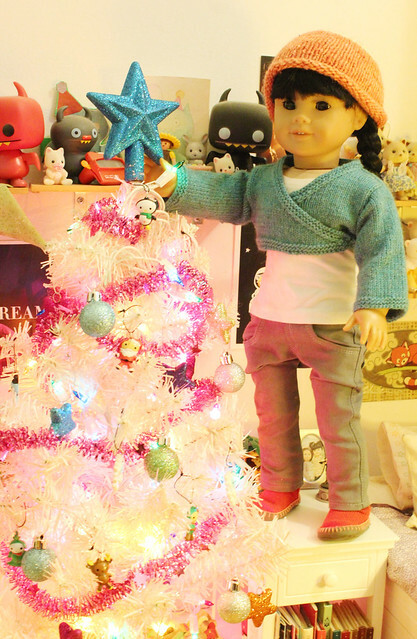 Until I find the perfect purple tree, we use a pink tree with Mom's mini Hello Kitty decorations. I LOVE the sweater Inky! We put up our tree on 16th Dec and it is normally a plastic one. Mom decorates it but no singing of songs as we cannot sing very well. Santa arrives on the night of the 24th and we open presents on the 25th. We have lights on the tree and the cat normally plays with the lights. My Mother is 1/4 Ukrainian, so we always include lots of Ukrainian traditions in our Christmas festivities! We had a real Christmas tree this year! It drops pine needles all over the carpet, but I just love the smell so much! I love your sweater too! I've been wanting one like that for ages. What pattern did you use, or did you buy it?? Let me know if you end up knitting it!